Since the rise of comic conventions, there has been a simultaneous rise in the art of cosplay. 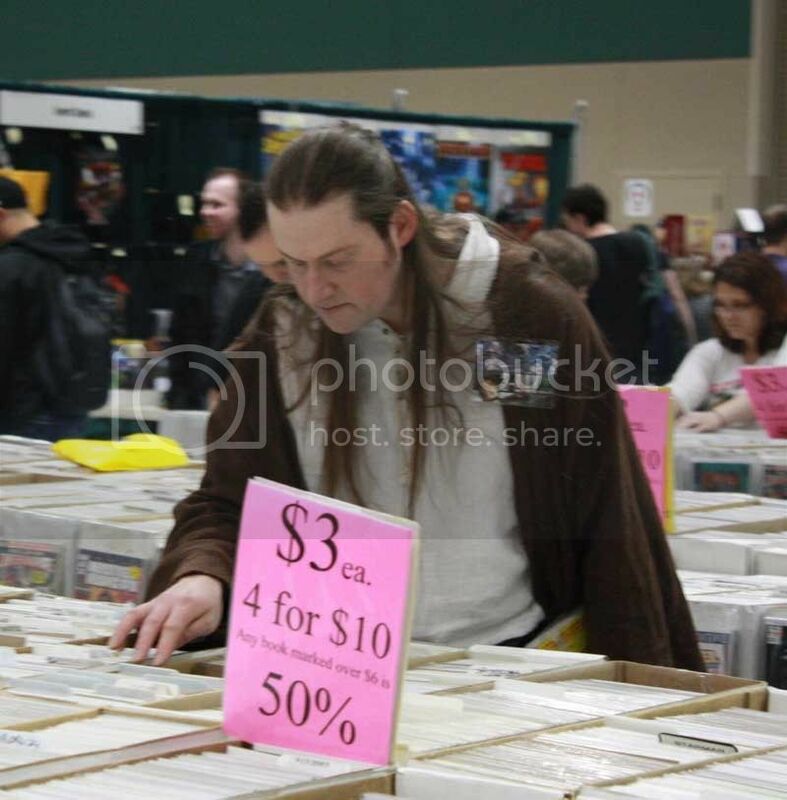 These costumed conventioneers can usually find themselves on the internet later if their costume was either 1. really really good or 2. really really bad. However after a recent outing at the Seattle con (Emerald City Comic Con), I came to appreciate cosplayers in a whole other way. As I finished my lunch with a couple cohorts at the Cheesecake Factory across the street, we looked over a table in the corner. Here was Nightcrawler. Blue skin, tights, blue hair. And he sat in his booth looking over his check, trying to figure out how much to tip. 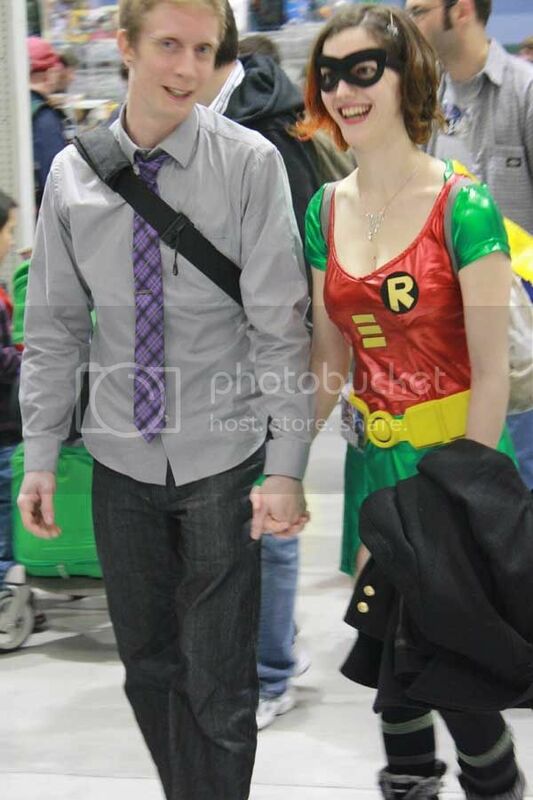 You see, at cons, usually the pictures of cosplayers involve them posing for them. Immediately afterwards, they continue to roam the con and do all the same con-y things anyone else there is doing. They chow down on their lunch, check their phones, and do things that look wholly un-superhero-y. So here’s the first half of collection of pictures taken at ECCC, of these heroic cosplayers, JUST HANGING OUT. Oooooh! 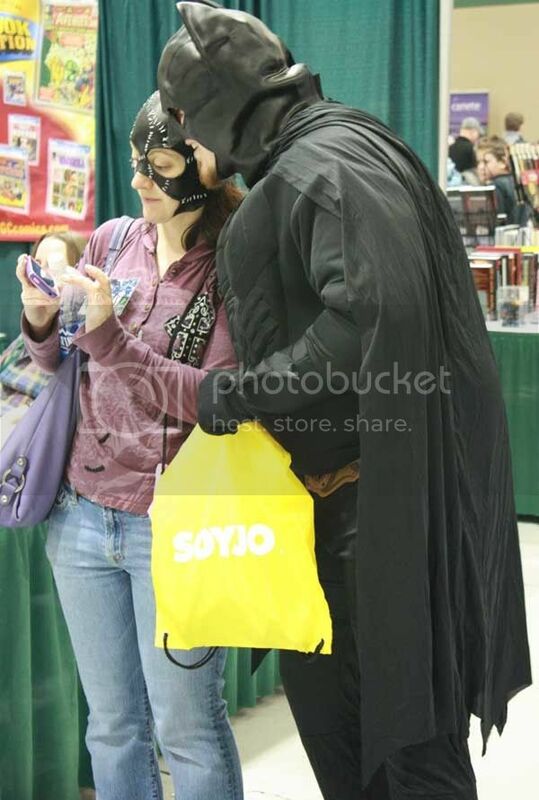 Batman got one of those free Soyjoy bags they were giving out! At least yellow kinda goes with the suit. Search these comics, you know it to be true. 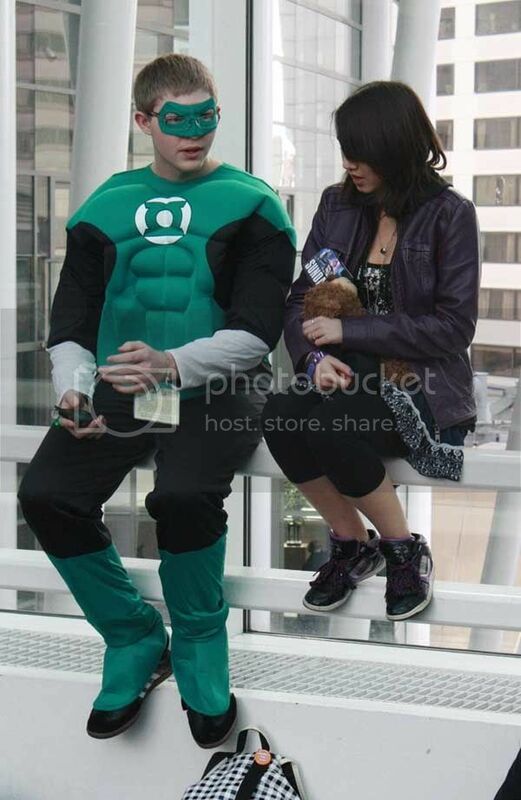 Lady Robin hanging with a boyfriend? Is this canon? 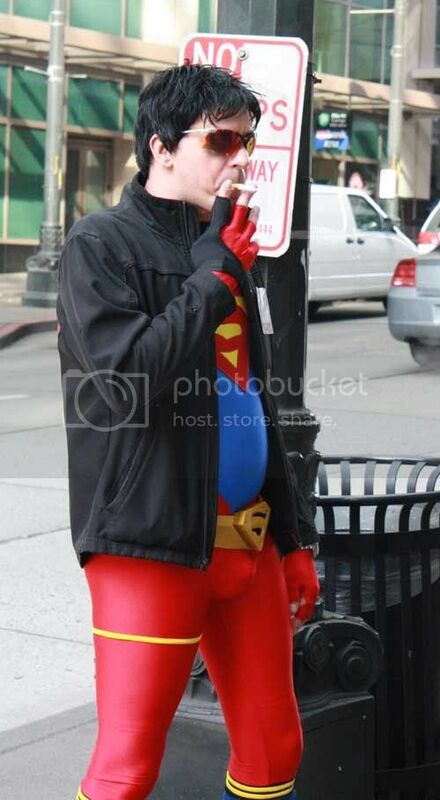 And the last for Part One, I was completely amazed when we saw this guy walk outside in his Superboy costume and LIGHT A DAMN CIGARETTE. As soon as he was done, he went back inside and was immediately asked to pose for a picture with a couple of 5 year old girls. 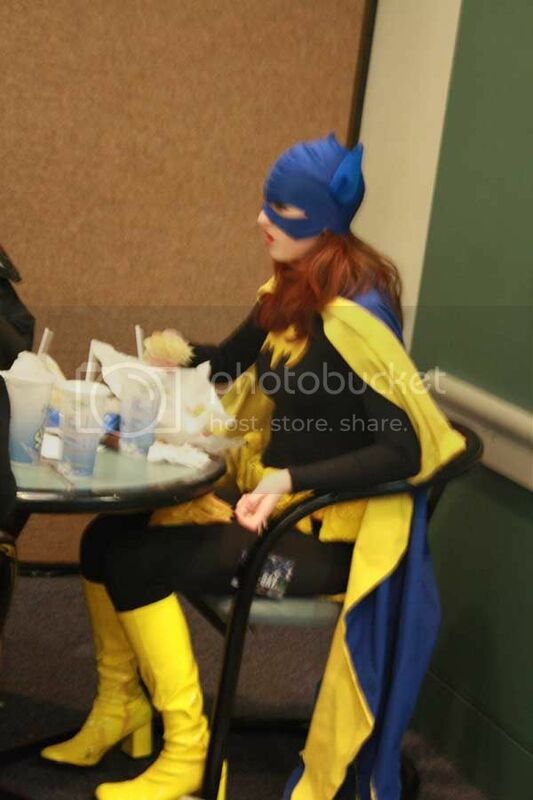 This entry was posted in Off-Duty Heroes, Pictures and tagged Comics, cosplay. Bookmark the permalink. That is fantastic. You are still the queen, Jordyn.